Sweet Stamps Challenge this week is to use White on White + one other color. This is for a First Communion- and the recipient is ALL Boy! So, I used Bluebell Coordinations and White and that is it- no pearls, no ribbons...nothing else! The Sweet Stamps Challenge this week is to use THREE of something. I used Three pearls on the bottom border die. The background is a Technique Junkies technique called Designer Paper Starburst. Well, for my Birthday I am going to share some Yummy Blog Candy with you!!! Yep- what do you think? Included are: B63 and B66, RV23, Rv25, RV29 and YR21- perfect for coloring flowers. I used Peerless Watercolors on Watercolor paper 5.5" x 5.5" and just painted on strips of Rainbow colors. I put the watercolor paper through the Big Shot using the Cheery Lynn Die Honeycomb. My first idea was to put the 'inner' pieces that pop out in the opposite colors- but that looked dreadful..... So, I took them all off, and just arranged them back in order...... I left the edges irregular- like me- and I thought it was perfect with the Psalm sentiment- one of my favorites : ) The butterflies are colored in Rainbow colors too- one Red/ Orange, one Yellow/Green, and the other Indigo/Violet. You can't see in the photo, but there is also Creative Inspirations Fairy Dust Paint for some shimmer on the background and a touch on the edges of the Honeycomb 'innies' edges. The sentiment cut out is a Cheery Lynn Die as well. The Sweet Stamps Challenge this week is to stamp your own background paper. From the new Technique Junkies newsletter, I used a technique called Bands of Color- only I added stamping into the mix to qualify for the challenge. For the main image, I used a wax paper resist technique and three colors of Shades Die ink- Aegean, Buttercup and Forget-Me-Not. I sponged on the color, and then added Fairy Dust Creative Inspirations paint some shimmer. I did my background technique, then stamped the background image in the same color on the 'band' of color. I wanted to share another card using the chalkboard technique- I had a blast creating an 'Oz' scene with a stamp set from Artistic Outpost. Something a little different than the word stamps I have seen with this technique....which of course I learned from the Technique Junkies. I used Graphic 45 DP for the background (from my stash.....) and added some Cheery Lynn Designs corner dies, pencil, white ink and rhinestones. 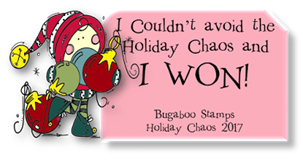 Simply Create Too- Use your Stash- The stamps, the metallic rhinestones, the Graphic 45 DP that I was hoarding.....! Moving Along with the Times- Inspired by a song or Movie! 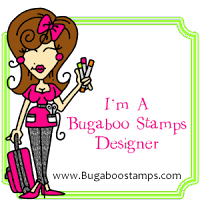 The Sweet Stamps Challenge this week is to use 2 stamped images. From the new Technique Junkies newsletter, I used a background technique ..... that I had to try- called Copic Color Double embossing. It involves Copics, an embossing folder and embossing powder. I used 4 families of the sketch sets- Sunshine, Tea Rose, Spring Leaf and Teal. I colored the images with the same Copic colors, and used Fairy Dust Creative Inspirations Paint on the butterfly image. We have a monthly challenge as well- 3/15-4/14 Wax Paper Resist- you have a chance to WIN $20 $20 of items from the store at Sweet Stamps. I used a library card insert (given to me by my friend Laura) for the first two trades. The left ATC was watercolored, I used the white Signo pen and some Stardust gelly roll pen, On the Rt- Dylusions spray and stencil. On the ATC on the Lt, I added different words on the inside flap. Using Alcohol Ink Splatters backgrounds, I added stamps, writing (1970's tunes) and a stencil with writing in the little open spaces. Two more made with Dylusions Sprays and the butterfly stencil. I sprayed the ink over the stencil, added the newsprint, then traced the stencil again. These two were not traded- want one??? 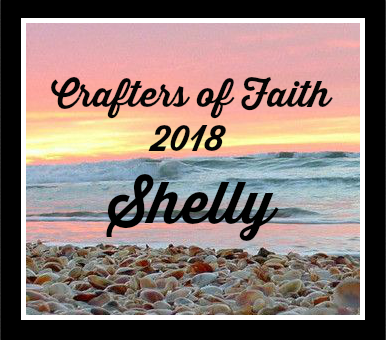 This was my 1-4-1 trade- a mish-mosh of techniques and Journaling. On the Lt- Diane M and on the Rt Diane S.
On the Lt- Linda and on the Rt- Carol. Carol wrote a journal across the front and back of 12 ATC's, then cut them apart. On the Lt- Debbie- and the pencils were made from toothpicks. On the Rt Harriet. On the Lt Mary- she made a little journal book, and on the Rt Cindy. This is the front of Mary's book-and how cool- see the binding? Marcie took photo's and added Journaling. 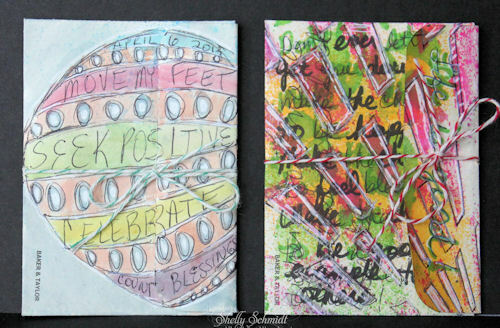 I am going to link up my Journaling ATC's to the Fashionable Stamping Challange. When the new Technique Junkies newsletter comes out, I am like a kid in a candy store : ) I love being able to use supplies that are sitting on my shelves in a new way! So, for my alcohol inks- I used Copic refills and followed the technique instructions. I used the same colors for coloring that I used for the background. The image is from Rare Image Rubber stamps, and the sentiment Create with TLC digi. I made alot of these backgrounds, both with my limited Copic refill colors and Alcohol Inks- the colors are just fabulous IRL! I colored the ribbon with a BV02 marker and used Eggplant SU cardstock. The Technique Junkies have released TWO new CD's: Move It and Shape It. I have to say- Pat has outdone herself again!!! The CD's are ready for mailing, and I hope you are enjoying seeing the DT showcase some of the techniques and getting some ideas for what you will make once you get yours! You have arrived here from Nancy's Blog with awesome Denim and Milkshake inspiration! If not, HERE is the link to the beginning of the hop. My first Project is called Inside Out and it is from the Move it CD. How fun is that!!! I used images by Sweet Stamps ( Tulip , Background , and Sentiment ). The DP is Bo Bunny, the Pearls are Prima, The Butterflies are MS punch and Glimmer Mist watercolor. I watercolored the image with SU ink- inside and out. I had to make this Folding Screen from the Shape It CD- I knew immediately when I saw it what I wanted to do. Michael Strong recently posted these digi grid images on his blog HERE (March 13th post). I used the circle images from the Cloisonne Accents set as faux lanterns. I made the little tassels for the bottom of the lanterns from thread. The punches are EK Success and SU. (There is an index for each CD, with pictures of each project available on that page). Oh there is a new Technique Junkies newsletter out..... : ) This technique is called Bands of Color. I used Ranger inks Spun Sugar, Shabby Shutters and Tumbled glass. I used Shabby Shutters on a few strips of cardstock and used the grass die to cut out a few layers of grass. I stamped the Dahlia onto the card and again on cardstock- and fussy cut out the flower head and the leaves. I colored with Distress Markers. I outlined the leaves so no white was showing from cutting out the leaves. I added some Gelly Roll Pen in the center of the flower. I felt I needed to add something to balance the card, so I cut out a dragonfly from the Cheery Lynn Mini Critters die cut. I outlined from the negative part of the die onto vellum and painted the vellum with Creative Inspirations paint- and one dried added the painted vellum to the frame of the dragonfly. It was really hard to photograph the shimmer. The blue paper was shimmery to begin with.